German company, it specialises in manufacturing home audio equipment. It was founded in 1945 by Max Grungig, an enterpreneur, selling Fuerth, Grundig & Wurzer (RVF) radio transmitters, since 1930. Nowadays, it is a property of Turkish consortium – Koc Holding and is active mainly in the TV manufacturing field. 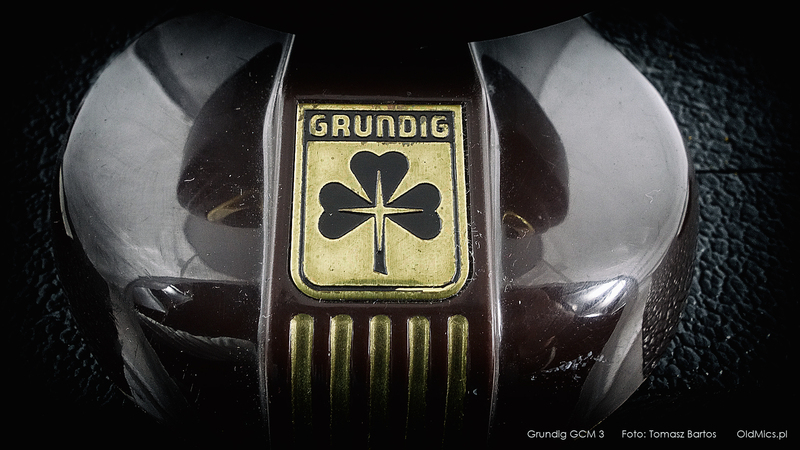 Since always, Grunding specialised in utilitary electronics. Their mics were directed mainly in the consumer market. That doesn't mean that Grundig doesn't have its gems. The ones worth looking into: GDM 121, GDSM 202 or GDSM 200. One of the nicest-looking models made by Grundig, manufactured from 1956 to 1957 in two colour versions. Our model is the brown version, the blue version is also available. Interestingly enough, this is a condenser, not a dynamic microphone. We don’t know what it sounds like – we need a suitable preamplifier to this end. A braided cable ends in a 3-pin DIN connector. A stereo microphone completely made of plastic with 20 V power. The structure allows for separating both capsules. The cable with a 6-pin DIN connector at the end. 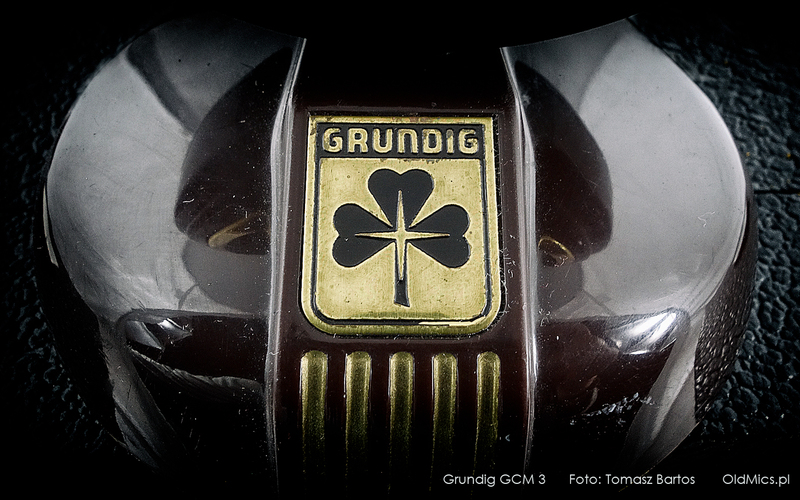 A plastic structure with the Grundig logo from the 1960s. A specimen kept in good condition, with a braided cable with a DIN connector at the end. A bakelite Grundig microphone from the 1960s. A gold-plated grill with a beautiful logo, which you can download as wallpaper. Considering its age, the equipment delivers surprisingly good recording quality. An inflexible, rather stiff cable with a DIN connector. A dynamic microphone made of plastic, featuring a braided cable with a 3-pin DIN connector. Gold-plated mesh grille. 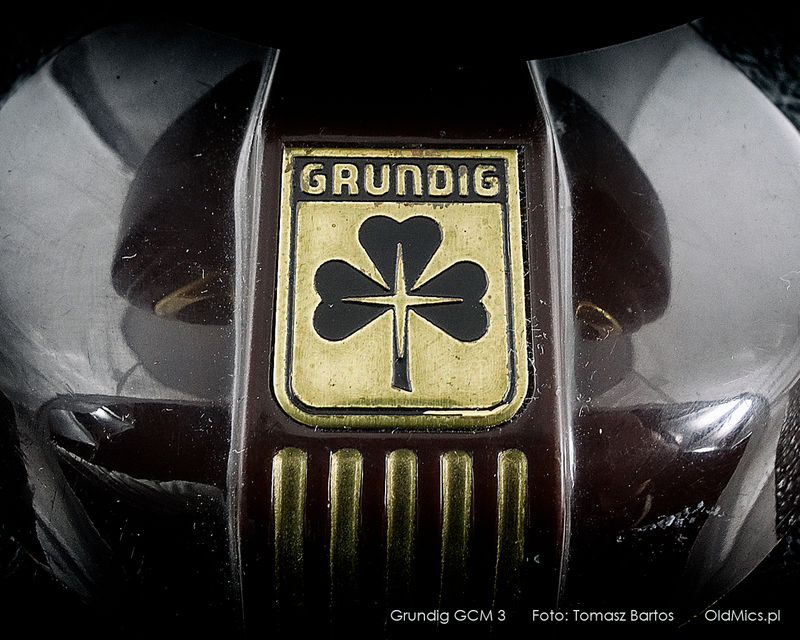 Like GDM 15, it was sold in a very elegant metal box. One of legends created by this German manufacturer and one of their best microphones. Comes in two colour versions – gold and silver. Its twin brother, regarded as one of the best dynamic microphones worldwide, is Sennheiser MD 21. Brilliant, unique sound. Still sought after. One of classic square mics supplied with reel-to-reel tape recorders made by Grundig. A plastic body on a metal support with a silver-coloured grille. Sold in a stylish box. A braided cable with a 3-pin DIN connector. A dynamic microphone of a German square mic series in a unique, plastic box with a transparent lid. Nothing exceptional about the looks or the sound. The bottom wall contains a stand hole. The cable features a 3-pin DIN connector. A plastic dynamic microphone with a rather non-standard shape. Packaged according to the fashion of the time in a plastic box with a transparent lid. Sadly, our microphone lacks labels which could provide details about the brand. The cable features a 3-pin DIN connector. Another one from the series of German square-shaped microphones, in a transparent plastic box. The cable has a three-pin DIN connector. This dynamic microphone has no support or a holder for placing it on a tripod. It is intended for working in the lying position. Just like me. A plastic dynamic microphone. Originally it was supported on a wire stand. Unfortunately, it is not included in the set. Due to its tonal properties and a fairly attractive price, the set is popular among harmonica players. DIN plug with three pins. GDM 318’s twin brother. A dynamic microphone with an almost modern shape. Designed and working in a similar way to other budget models by this manufacturer. Packaged in padded plastic box. The cable ends in a 3-pin DIN connector. A plastic dynamic microphone from the GDM line. Packed in a durable lined box. A light and well-crafted construction. The cable has a three-pin DIN connector. A plastic dynamic microphone mounted on a tripod. Nicely designed, packed in a cardboard box. The sound it offers is really mediocre. The cable ends in a 3-pin DIN connector. A dynamic microphone for reel-to-reel tape recorders, manufactured in the 1960s in Germany. Our microphone lacks the originally supplied standard Grundig stand. The sound, as we may expect, is not mind-blowing. The cable ends in a 3-pin DIN connector. Looks like GDM 313 – even the packaging is very similar. The only difference is the head finish. An average-sounding dynamic microphone. The cable ends in a 3-pin DIN connector. A dynamic microphone from the 60s with a tripod stand. Packed in a padded box suggesting its higher value. :) An unscrewed cable is terminated with a socket with two pins at the body and a three-pin DIN plug. Operational. An untypical GRUNDIG microphone with a switch in the handle. Its most likely application was to be used in law firms, courts and offices. A coiled cable with a non-standard 10-pin serial connector. It was probably meant to fit shorthand machines (stenotopic). Hence the name, Stenorette. Grundig/Sennheiser GDSM 200’s smaller brother. A stereophonic microphone with great looks and an interesting sound. Highly recommended for recording electric guitars from the amp speaker. Movable heads for adjusting the sound. A handy, elegant white case. A very long cable with two DIN connectors. Plastic, lightweight construction for hanging on a bracket. Dedicated for office recording devices. Recording switch on the body. Cable is ended with an unusual serial connector with five pins. 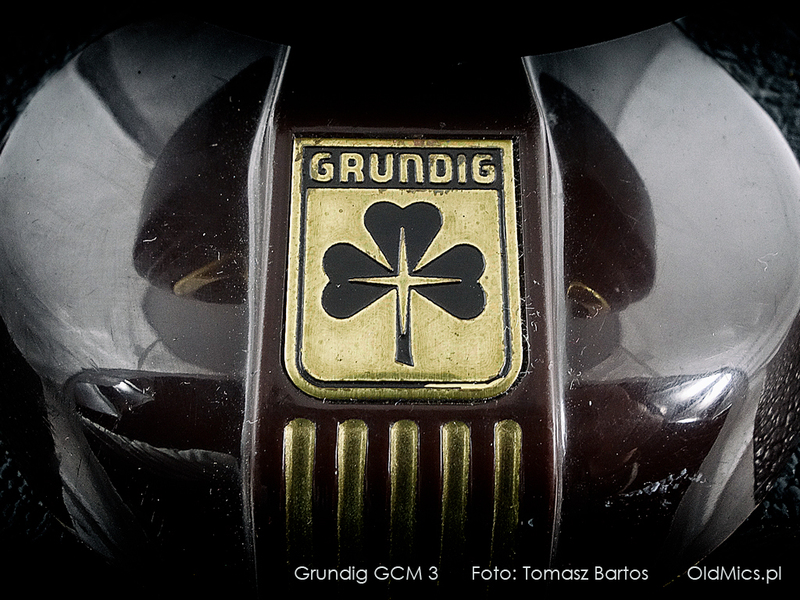 We know little of this Grundig, except that it looks identical to the Labor one with the same number. Relatively rare at auctions. Ours is badly battered, but we may manage to replace it with a more well-kept piece. A braided cable ends in a 3-pin DIN connector.